We offer a wide selection of Comic Books, many titles from many publishers! Browse through our categories to find all the Comic Books you are looking for! SPAWN Comic Book Collecting Starter Set Kit with Stor-Folio Portfolio and Comics $19.99! 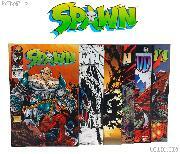 SPAWN Comic Books Bundle of 18 Different Titles from SPAWN Franchise $18.49! SPAWN Comic Book Collecting Starter Set Kit with Box, Boards, Bags, and Comics $55.99! SPIDERMAN Comic Books Bundle of 12 Different Titles from SPIDERMAN Franchise $12.99! Comic Book Collecting Starter Set Kit with Box, Boards, Bags, and Comics $65.99! SPIDERMAN Comic Book Collecting Starter Set Kit with Stor-Folio Portfolio and Comics $19.99! SPIDERMAN Comic Books Bundle of 18 Different Titles from SPIDERMAN Franchise $18.49! SPIDERMAN Comic Book Collecting Starter Set Kit with Box, Boards, Bags, and Comics $55.99! WOLVERINE Comic Books Bundle of 12 Different Titles from WOLVERINE Franchise $12.99! WOLVERINE Comic Book Collecting Starter Set Kit with Stor-Folio Portfolio and Comics $19.99! Comic Books Bundle of 12 Different Titles from Various Franchises $9.49! Comic Books Bundle of 18 Different Titles from Various Franchises $13.99!